Stress places numerous strains on the human body, not the least of which is how it affects your appetite. Few of us reach for celery sticks when stressed…but a new study suggests that we might want to do just that. 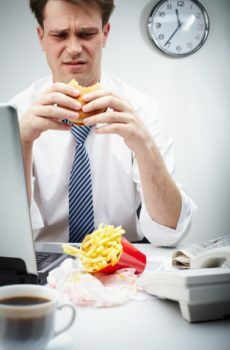 Researchers studied the metabolic effects of a previous day’s stressors in the face of a high calorie, high fat meal. Participants were asked about their stress the day before and metabolic measurements were taken before and after a high fat meal. What they noticed was interesting: those reporting the greatest stressors had a lower metabolic rate and higher levels of insulin, which is a hormone that encourages the deposition of fat in the body. Stressed out eaters actually burned fewer calories post-meal than more relaxed eaters, which could result in significant weight gain over time. This study had a few limitations, namely that it looked only at women and not men. Researchers also didn’t test the effects of a healthy meal – as there is some inkling in the literature that certain nutrients can buffer the physical effects of stress. What this article does highlight is one more adverse effect of stress on the human body and we should be mindful of our eating habits during stressful times. Here at My Whole Life, we recommend that you try a few moments of deep breathing before eating to help lower stress hormones, which affect your digestion as well as your metabolism. In stressful times, reach for healing foods that nourish your adrenal glands, such as vitamin B rich greens, legumes and vitamin C rich fruits and vegetables. And when the time comes for comfort, reach for a soothing bath, a phone call with a close friend or a walk instead of greasy food – which will only harm the body further.